Our hotel in Grenada, West Indies is known for being charming, quaint and a place where it feels like you’re part of a house party. 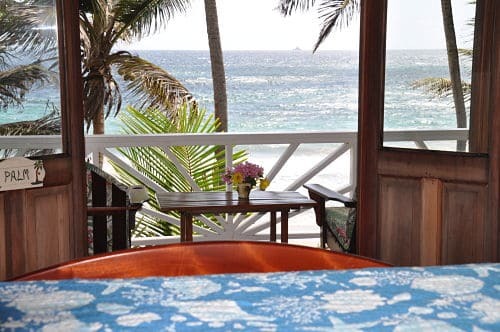 We offer beachfront cottages, oceanview cottages and honeymoon suites. If you need a break from the busy-ness of your life and a place to unwind, then you’ll find that this is the perfect spot. Who doesn’t love swaying palm trees, the sound of the waves kissing the shoreline and sunshine? A heavenly break in the Caribbean could be all that you need to revitalise for greater success in your career and life. 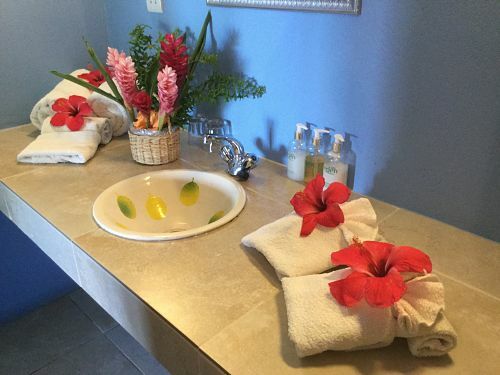 What’s not to like about staying in a hotel in Grenada, West Indies? First of all, let’s consider the location of our beachfront cottage. If you have already visited Grenada, West Indies then you’ll already be wise about how beautiful it is, the warmth of the people and how you can escape from the stresses and strains of the everyday life! Fortunately, the staff in our hotel are archetypal of the island – they exude the friendly helpfulness of the people of Grenada. They warmly welcome visitors, smile and make you feel right at home. Now it’s time to look around our beachfront cottage. We have three of these and they go like hotcakes so be quick. You can make a reservation here. We guarantee that booking direct will get you the best price. 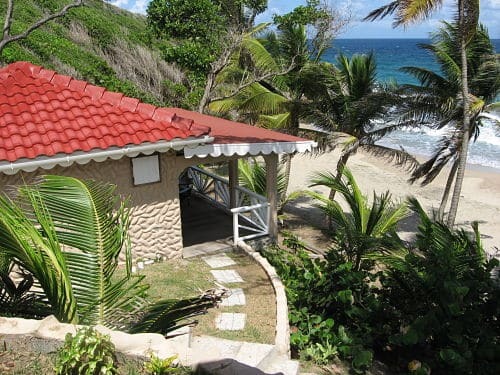 Overlooking the Caribbean Sea, you’ll forget about everything but the view of the beach. 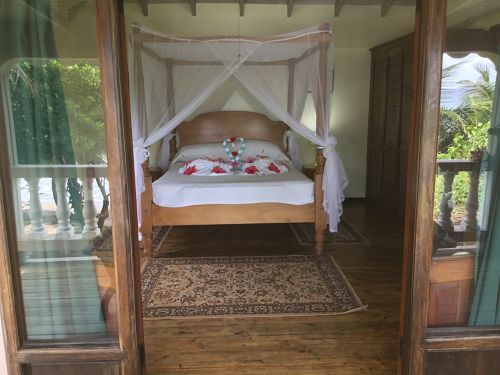 Laid out in our the tropical gardens of our grounds to give you as much privacy as possible, the cottages come complete with a hammock. A handpainted sink brings a visual nod to the tropical nature to your bathroom. Our guests love using the shower. There’s a window that overlooks the sea so you can enjoy the sensation of the solar warmed water whilst you feast your eyes on the view of the islands. All the while you will be able to hear nature at its best. Drink in the sound of the breeze and the waves as they touch the shoreline. In the evening you may hear the tree frogs chirping and sometimes even the cane toads with their deep mating call. Each bathroom has complimentary shower gel and shampoo. You’ll conveniently find a hairdryer also available for your use. We operate a green policy, so you can have your towels changed daily, but we recommend that you try to use them for more than one day for the sake of the planet. 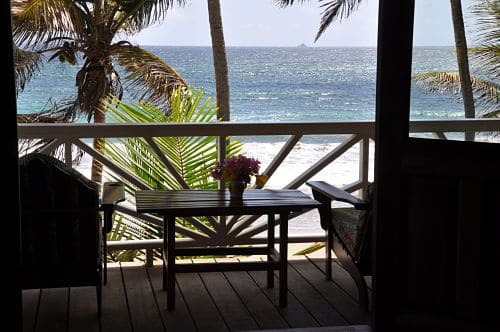 Touted as one of the most romantic hotels in Grenada, West Indies, Petite Anse has a pool, restaurant and easy access to the beach. We also offer ourselves as the perfect venue for weddings, honeymoons and other celebrations. If you’d like to make the best of being in this part of the island, then you can take one of our tours or even drive yourself around using our car hire. Here is a link to information about our restaurant. On Sundays, we host a 2.7mile walk to the local village followed by a BBQ buffet lunch. If you’d like to find out more about what you can do when you visit Grenada, subscribe to our newsletter and receive an ebook about all the things you can enjoy. More images of our beachfront cottage.